The 1957 Corvette was the second year of a redesign of the original model. 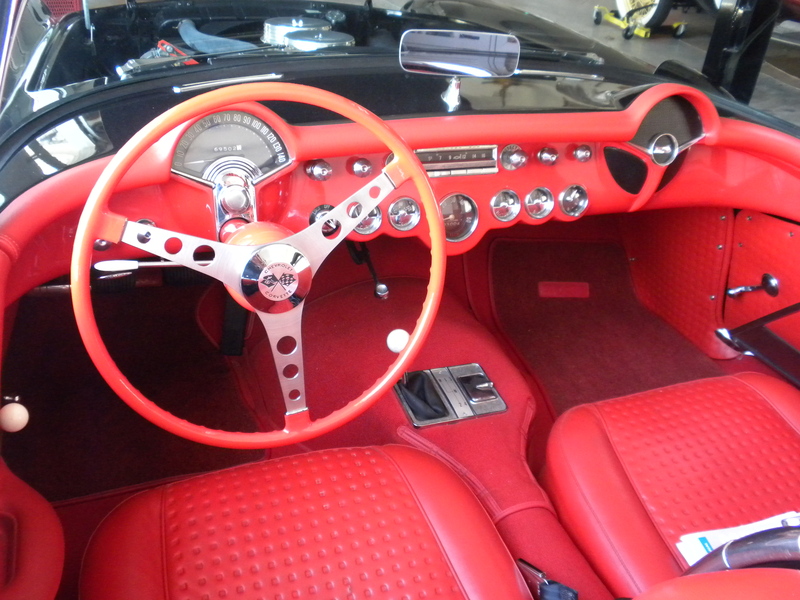 The only visible difference between a ’56 and ’57 Corvette is the locking nut on the dash mounted rear view mirror. It’s a wing nut on the ’56 and a hex nut on the ’57. Chevrolet built about 3600 Corvettes in the 1957 model year of which onyx black was the most popular color. 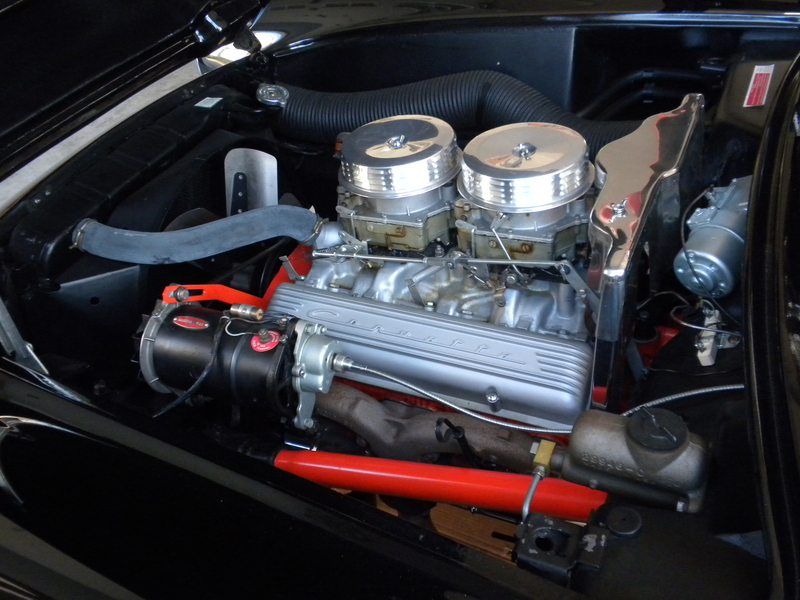 Fuel injection was first available in 1957, and, with the optional cam, produced 283 HP out of the 283 cubic inch V8. All the available engines were 283s. Standard carburation was a single four barrel and options included two four barrel and two fuel injected versions. A four speed transmission was first available for the ’57 Corvette. Corvettes could also be had with a three speed or Powerglide two speed automatic. The four speed was not available until about April 1 of 1957. The 1957 Corvettes are the last models with single headlights. 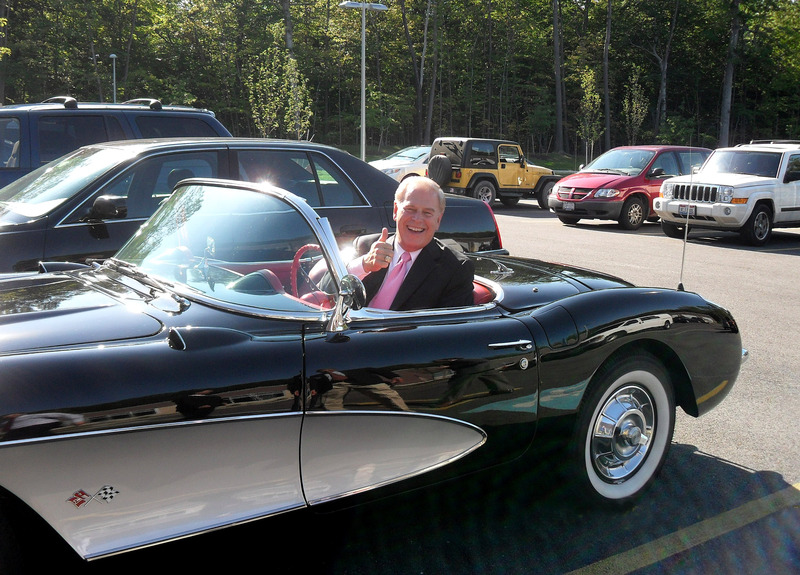 With my wife’s blessing, my ’57 Corvette was sort of a 60th birthday gift. Although the purchase of the car coincided with my birthday, there are a couple of more relevant reasons why I bought it. Having purchased the Bel Air earlier, I had entertained the idea of adding an onyx black Corvette of the same year to have both of the ’57 collectibles. 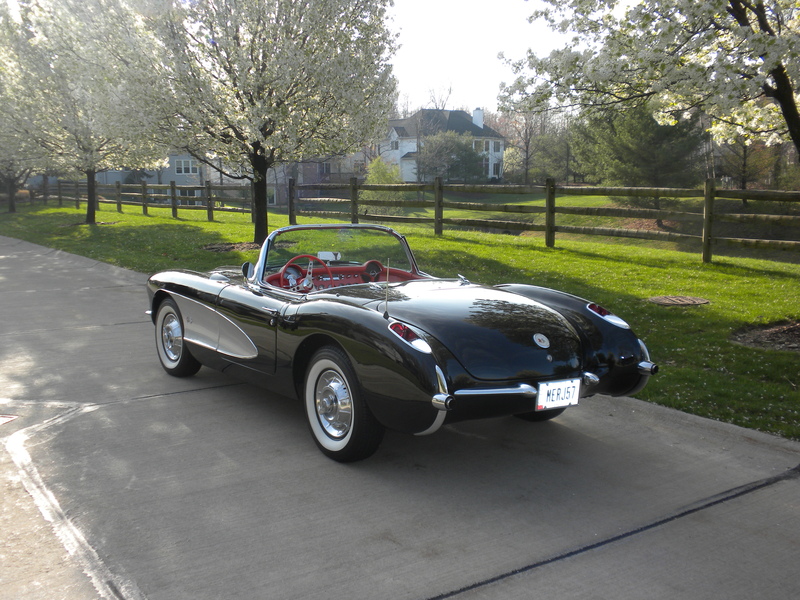 In the meantime, a very good friend and avid Corvette enthusiast had finished a thirty year restoration of his black ’57. The car was beautiful and he was justifiably proud. We decided to do the show circuit in 2007 with my black Bel Air and his twin Corvette. For the time being there was no need for me to invest in my own ’57. We looked forward to a fun summer of showing off the cars as a pair, until the unexpected happened. In the spring of 2007 my friend died of a heart attack while standing at the first tee. It was a loss shared by all who knew him. His family, knowing the importance of the Corvette, prominently displayed it at his funeral. 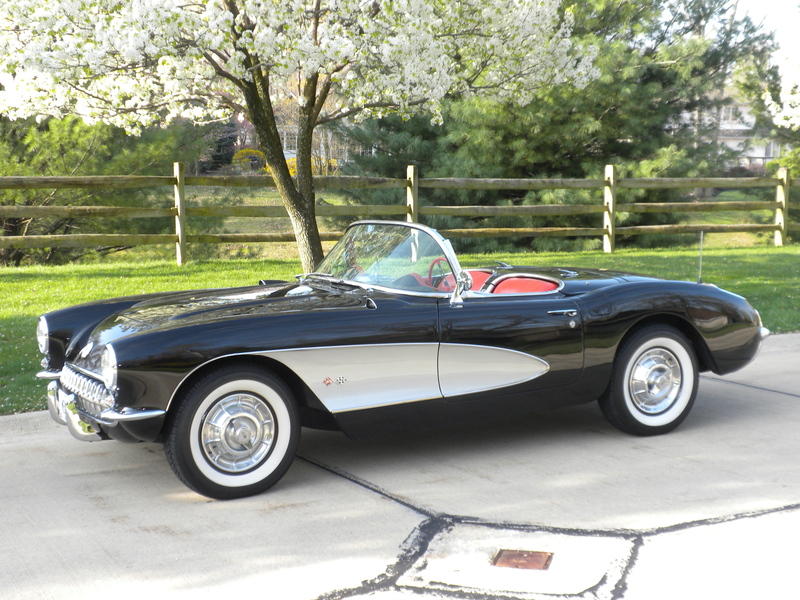 I decided shortly after to begin looking for an onyx black, silver cove ’57 Corvette. The car was now more than a twin to the Bel Air, it had also become a tribute to my friend. After six months of looking and researching, I found what I was looking for near Detroit. The paint, chrome, and interior were very presentable on the car. The engine compartment, however, needed sprucing up. The previous owner had removed the original Carter WCFB dual four barrel carburetors and intake manifold and had replaced them with a single four barrel unit. The claim was that it made the car easier to drive. Fortunately the original carburetors and intake manifold were in the trunk. 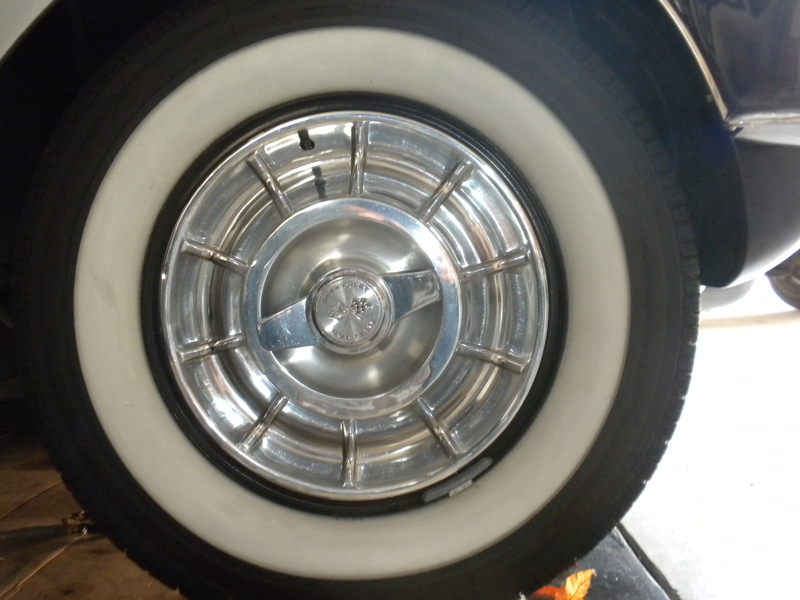 The previous owner had also replaced the original front drum brakes with discs. Although not true to the original, the added safety of the disc brakes was deemed acceptable and even desirable. The car also came with a removable hard top. The car was delivered in late 2007 and planning began for the engine compartment restoration. Since the work was beyond my capabilities, I searched for someone with experience to do it. I eventually found a couple of knowledgeable Corvette guys and gave them the car along with my instructions of what I wanted done and an NCRS judging manual. My wife and I then headed to South Carolina for three winter months. While gone, I communicated regularly with the restorers and ordered parts from Corvette Central. As the winter wore on a couple of things became evident. This work was going to be considerably more expensive than anticipated. Also, the 283 block, heads and four speed transmission, although correct for the car, were likely not original to the car. On the exterior, the previous owner had added crossed flag emblems in the coves. Although correct for fuel injected Corvettes in 1957, I can find no evidence of their being correct for non fuel injected models. They look good on the car, so I decided to forgo one small bit of accuracy and left them alone. The carburetors were another unexpected problem. Although they cleaned up well, it was obvious they needed rebuilding. After research, I shipped both of them to California and anxiously awaited their return as they were the last thing needed to get the car on the road. Finally they arrived, but, after installation, it was clear that we still had a problem. Local word of mouth took me to Ron Hutter at Hutter Performance in Chardon, OH. Ron had an impressive operation, and, besides being very knowledgeable about Corvettes, he was a racer. His shop had built engines for a number of prominent race teams including Dale Earnhart Jr.’s Busch Series Chevys. About a week after I had the car hauled to Ron’s shop, he called to tell me it was ready. The car ran and sounded great. Ron said that most of his time was spent in rebuilding the rebuilt carburetors. Ron’s professionalism was top notch and his charges more than fair. For one of the few times in my brief history with the ’57, I felt I had received fair treatment. Also, upon contacting the California based shop that had originally restored the carburetors, I was given a refund of their charges. The Corvette was a learning experience that could serve any classic car buyer well. Restoration is usually more time consuming and much more expensive than anticipated. Buying a car that is pretty much the way you want it is the safest bet. There’s more than a little truth to the old line about the restorer who tells his client, “Give me $50,000 now and I’ll call you when I need more.” The magnitude of work on the Corvette engine compartment, although much less than more extensive restoration, was, none-the-less, enlightening. On another note, I was able to locate the owner previous to the person I purchased the ’57 from. He was a very interesting individual who had retired to North Carolina. He told me that he had traded two restored Packards to a fellow in New Jersey for the Corvette. He also told me that he had been in charge of color and interior design for Packard in the early ’50s. He sent me a series of automotive articles he had written and included photographs of him and his design office at Packard. He also sent a photo of the car displayed at The Henry Ford Museum in Detroit. It was all very enlightening and he couldn’t have been more accommodating. The bottom line on the ’57 Corvette is that, in spite of a few hurdles to get there, it is a beautiful, period correct car that performs like new. Nice collection of cars. I especially liked the story about the ’57 Vette. I loved the 1957 Corvette story. I presently have a 1957 original Corvette inside mirror listed on Ebay. A person wrote to ask if the mirror had a S stamped on the stem of the mirror. It did, and when I wrote back, they immediaetly bid on the mirror. What is the meaning of the S? Lynn, I wasn’t aware that there was an S stamped on the mirror stem, so I checked the mirror stem on the ’57. Sure enough there’s one on the driver’s side about half way up. I had no idea what it meant so I tried searching for an answer. So far I have found nothing that explains what it means. Maybe we could both find out by asking the fellow who bid on your mirror. He must really be knowledgeable about C1 Corvettes. I’ll keep looking, but let me know if you find anything. I’ve got a few Corvette friends here that are real curious about it. I’m looking for two orginal 57 Corvette air cleaner wing nuts. Do you have any or know where I can find orginal wing nuts. I don’t have any, but have had luck finding small parts on ebay and reproductions at Corvette Central, Keen Corvette or any of the other Corvette parts suppliers. I just bought an original air cleaner for my ’63 off ebay and noticed someone was also selling wing nuts for the same cleaner. Give ebay a try. Neat video of the 7 car removal process. This black car is starting to grow on me. Do you know if it was a factory black/red car. Boy, would my red one ever look good in that line-up. Thanks Tom, You’re absolutely right, the red one would look great in the garage. Let’s get together soon!